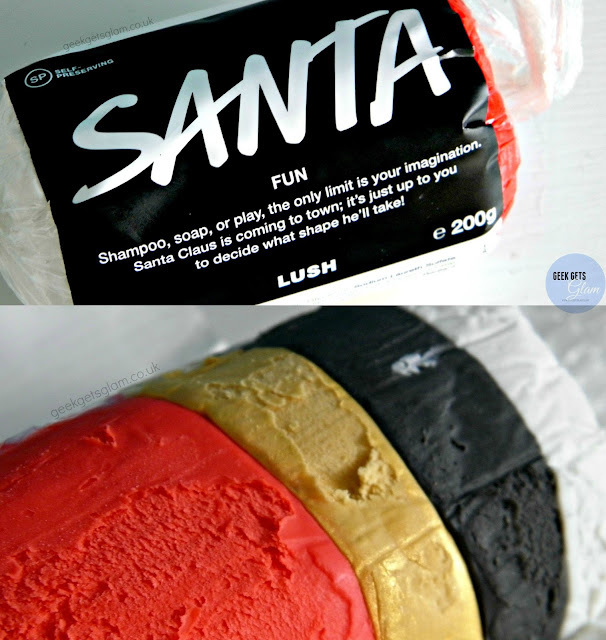 One of the most exciting things about this LUSH Christmas launch is that there are 4 bars of FUN! If you've not heard of it before, Fun is essentially bath play-doh; you can use it as soap, shampoo, bubble bath and, of course, mould things with it! The first bar of Christmas Fun I picked up was 'Santa'. Santa Fun is a kit designed to get you making your own version of Father Christmas. It contains four colours - black, white, gold, and red. It is fragranced with jasmine and ylang ylang so it's got quite a soft, floral scent. On the whole, I do like Fun. It lathers amazingly well and it quite a soft, creamy wash for your skin (it's great for kids' sensitive skin which is good as I'm guessing it's most children will want to use this!). I've not really used it much in my hair because I'm not sure how to go about it (I just can't get over putting play-doh in my hair haha) but it leaves my skin feeling squeaky clean so I bet it would be great in hair. As a bubble bath, it produces great bubbles but they don't last as long in the bath as regular Lush bubble bars - maybe I'm not putting enough in?! Also, leave Fun away from radiators/heat sources - it melts. I'm in two minds about Santa Fun. I can't get over the loss of Christmas Eve but this Fun does smell exactly like it and I can still make bubbles out of it so who am I to complain ;) Will you be picking up this product?